OAK RIDGE, Tenn., June 25, 2018— StealthCo, Inc., an Oak Ridge, Tenn.-based firm doing business as Stealth Mark, has exclusively licensed an invisible micro-taggant from the Department of Energy’s Oak Ridge National Laboratory. The anticounterfeiting technology features a novel materials coding system that uses an infrared marker for identification. The innovation of the taggant, which acts like a fingerprint with a unique encoded sequence or pattern, began in 2005 when ORNL researchers Glenn Allgood and principal investigator Linda Lewis teamed with Robert Smithwick III of the Y-12 National Security Complex to develop a cost-effective fluorescent dye system. ORNL’s taggant can potentially identify counterfeit goods that litter business and commerce. This taggant is invisible due to its infrared position on the light spectrum, which makes it unlike other anticounterfeit technologies available in the market. Similar products use ultraviolet light, which degrades the taggant over time. Recently, an ORNL Tech Transfer Technology Assistance Program project enabled Lewis, in ORNL’s Chemical Sciences Division, to conduct chemistry research testing of the taggant to assist Stealth Mark. Oak Ridge-based Stealth Mark is a wholly-owned subsidiary of the publicly traded company, Wellness Center USA, Inc. Stealth Mark strives to eliminate counterfeiting activities through accurate identification and authentication of products. Cal O’Horrow is the CEO of Wellness Center USA, Inc., and Rick Howard is the CEO of Stealth Mark. “This marker is an anticounterfeiting material for use with a target market of high value, high liability, and high security needs. We will target this product to authenticate materials such as art, currency and other items whose value is based on its authenticity. An example is a signed baseball, which is only worth a few dollars unless it’s authentic. It will also help with items that pose a physical threat, like airplane parts, where safety relies on authenticity. Our two target markets to implement this technology are textiles and currency,” Howard said. Since 2014, Stealth Mark has looked to advanced taggant technology to provide holistic answers to counterfeiting and theft, such as the company’s global data research through the ‘ActiveDuty’ anticounterfeit digital threat assessment program. 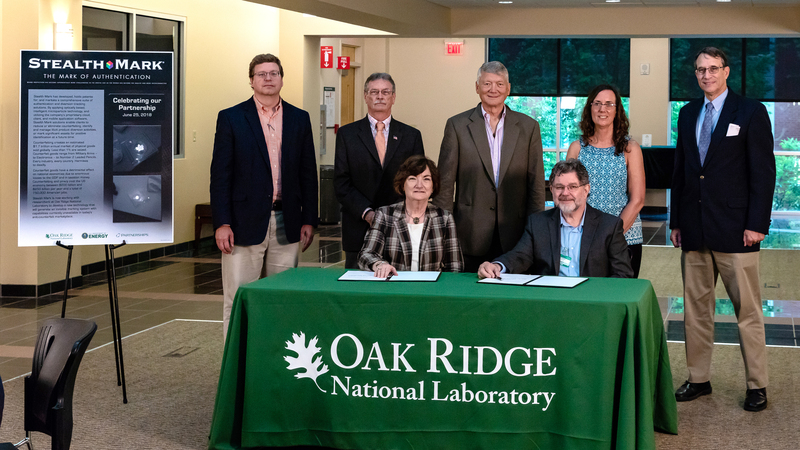 Through the new product R&D licensing agreement, Stealth Mark will use ORNL’s advanced invisible micro-taggant technology, Formula C2-4:18, to progress their anticounterfeiting efforts through the marking system. Stealth Mark is actively pursuing a commercial license. “It’s exciting to develop a technology that will actually carry forward in the commercial marketplace and be used for applications like preventing counterfeiting,” Lewis said. The formula is a permanent mark that requires a specific illumination to activate the desired spectral emission. The invisible taggant can be read by a hand-held detector or scanner that displays the taggant as a fluorescent marking. The device then recognizes the unique barcode and data revealed by the taggant, and the information can be integrated with existing databases and systems. By generating a unique coding system, the taggant can identify the item source, type, production and composition. This technology can specifically be implemented in textiles by coating threads with the invisible taggant before weaving, and a micro-code allows for tagging without damaging soft fabrics. The technology consists of four parts: a tag composition that is invisible in the visible light spectrum and emits fluorescent light in the nonvisible light spectrum, a binder that adheres the tag to the material’s surface, the solvent used to dissolve the tag and binder, and a solar protectant that hinders degradation of the tag. The taggant can be implemented in markings on almost any good, from invisible stamps on basketballs to invisible codes on currency, giving it a wide range of uses for a low production cost per taggant. “This taggant technology is complementary to the market areas we want to serve. 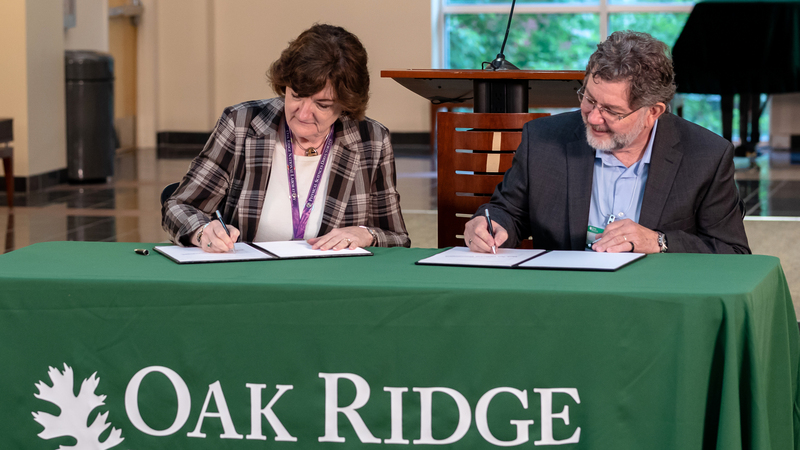 We are thankful to ORNL for their openness to us, and they have been great to work with us to meet this technology need,” Howard said.